Cable modems provide Internet connectivity through the hybrid fiber-coaxial carrier services infrastructure (HFC CSI). The HFC CSI was originally designed to deliver television signals to the residential market. As the need for residential Internet connections exploded, the cable industry optimized its network to provide high-speed Internet access. VoIP (voice over Internet protocol) then became a possibility for this market. Today the HFC CSI is used not only for cable television but also for traditional plain old telephone service (POTS) telephony and data services such as Internet access. These services are sold and billed separately on a monthly basis. Based on the cable company, customers may be able to choose which services they use. Traditionally, companies have required that users have at least basic cable service, but some companies are dropping such requirements. In some areas, it’s possible to get just telephone service or just Internet service over the coax cable traditionally used to deliver the television signal. You may wonder how VoIP can run on the same cable that provides cable television. Just as the cable can deliver hundreds of different television channels, it also supports the assignment of channels for Internet data services. For POTS telephony service, the cable companies can pick off the POTS signal and divert it into the public switched telephone network (PSTN). Because VoIP transports voice signals inside IP packets, the cable infrastructure doesn’t need to distinguish regular data packets from those packets transporting VoIP. After the customer is connected to the Internet, the VoIP provider takes care of sending and receiving the VoIP packets. The VoIP provider may or may not be the cable company. The cable customer is free to enter into a VoIP service agreement with any Internet-based VoIP provider. As of this writing, VoIP service plans range from $20 to $50 per month, depending on the number of minutes desired per month. Some VoIP providers have unlimited-minute plans. The VoIP carrier provides the VoIP adapter box at no cost provided that you sign a term deal (such as two years), or you may be required to purchase or lease a broadband VoIP adapter box. Make sure that you read the details in the service agreement. Table 1 illustrates the typical costs associated with running VoIP over a cable modem connection. Remember that the amounts shown in the table vary depending on where you live and what services you choose. After your cable modem is in place and functioning properly, adding VoIP is relatively easy. 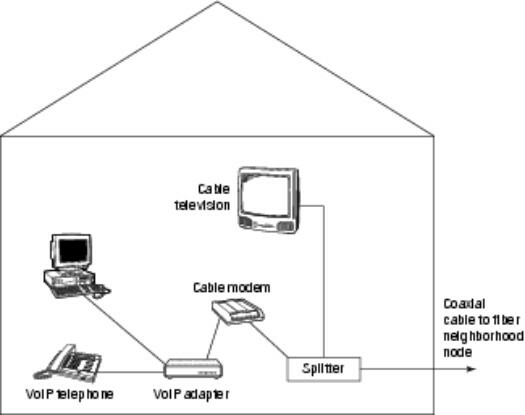 Figure 1 illustrates the typical method for connecting VoIP through a cable modem. Figure 1: Connecting VoIP through a cable modem. 1. Connect the VoIP adapter box to the cable modem. 2. Connect your computer to the VoIP adapter box. 3. Install the software provided by the VoIP provider. 4. Configure the telephone number and other parameters as directed by the VoIP provider. 5. Connect a microphone and speakers or plugs to the VoIP headset or handset. 6. Use the IP soft phone directly from your computer and begin to place VoIP telephone calls. An IP soft phone is software that provides a way to use your computer as a telephone. The software displays an easy-to-use dialing pad on the screen, along with controls for other common telephone functions. Some versions of soft phones provide an interface to a common directory, such as one maintained in Microsoft Outlook.